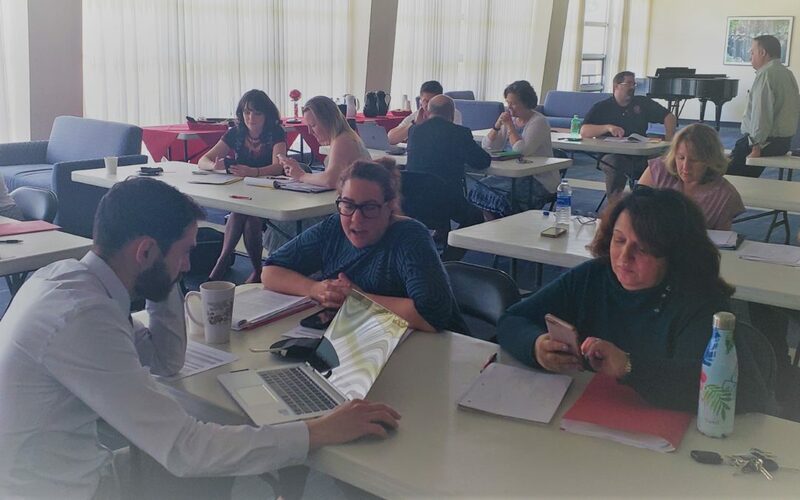 On June 1, 2018, D’Youville kicked off its new functional area assessment initiative, adopting the Council for the Advancement of Standards in Higher Education (CAS) standards. “Founded in 1979, CAS is the pre-eminent force for promoting standards in student affairs, student services, and student development programs.” Amy Yoder, Director of Retention Services and co-chair of the CAS executive committee led the kick-off informational session, which was attended by 60 administrative members of the D’Youville community representing over 30 departments. Over the next five years, these departments will engage in the self-assessment of their programs and services using the twelve CAS General Standards: Mission; Program; Organization and Leadership; Human Resources; Ethics; Law, Policy, and Governance; Diversity, Equity, and Access; Internal and External Relations; Financial Resources; Technology; Facilities and Equipment; and Assessment. The goal of the self-studies is to determine areas in which departments can improve student experiences, enhance student learning, and the College’s overall effectiveness. During the 2018-2019 AY, six departments are engaging in the process: Assessment Services, Financial Aid Programs, Housing and Residential Life Programs, Registrar Programs and Services, Educational Opportunity Programs, and Veterans and Military Programs and Services. Each department has a three-person review team to perform the self-assessments. On June 8, 2018, Sam D’Amato, Assistant Dean of Assessment and co-chair of the CAS executive committee, led members of the review teams through an orientation to the CAS guidelines and self-assessment process. One of the ingenious components of the CAS standards is its focus on enhancing student learning outcomes. In the past, functional areas were often referred to as “non-academic areas,” but CAS encourages departments to find ways to advance student learning. CAS promotes six Student Learning and Development Domains and Dimensions: Knowledge acquisition, construction, integration, and application; cognitive complexity; intrapersonal development; interpersonal development; humanitarianism and civic engagement; and practical competence. These outcomes align to D’Youville’s general education outcomes, which will strengthen the assessment of the general education program while contributing to students’ success. Review teams will share their findings from the first round of self-assessments with the College community in June 2019. For more information about CAS, please visit its website at https://www.cas.edu/.